All businesses, large and small, have operations and tasks that need to be done on the regular basis and properly documented. QR Mobile Data helps you make this process simple and efficient. Using QR Mobile Data mobile application your employees can document business operations in real time, without re-dos, double entries and errors. Regardless of where the operations are taking place: in the field, on the job sites, at the managed properties, at the client location or in the office, you can document everything that was done on site by using smartphones and mobile forms for data collection. Make sure that your business operations are running smoothly, your employees know what was done and what to do next, and you have a proper documentation trail. Whether you need to track operations and procedures for equipment or property maintenance, track operations in the nursery or a farm field, manage production processes or on demand custom projects, QR Mobile Data have you covered. Your employees can use their own mobile devices (smartphones or tablets) to document everything that was done, and access data on all previously performed steps on site in real time. All they need to do is scan QR code or barcode on the asset, property or project to identify it, access all necessary information and retrieve mobile forms to fill out. Collected documentation is stored in a secure cloud, and can be accessed by authorized personnel from anywhere. No matter what business you are in and what operations you need to track and document, you will be able to create mobile forms to accommodate your business workflow. Create mobile forms for each business operation or task where data need to be collected. Link forms to the specific group(s) of assets or properties, or make forms that are valid for all your business objects and projects. QR Mobile Data is created with the dynamic business operations in mind. No matter how often you need to change or adjust operating procedures, you will be able to easily adjust corresponding mobile forms via a web dashboard. Make sure your employees know exactly what needs to be done. Add clarifying text to the form fields, and image(s) to illustrate the task at hand. 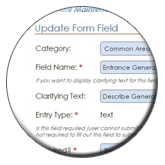 Create forms that require minimum manual entries. Include selection lists where applicable, and allow an employee to scan in value instead of entering it manually. Indicate which fields are required, and each field data type. Include any number of image field(s). An employee will be able to use these fields to take photos with a smartphone, and include them in the form for visual documentation. Create custom fields to record all required information on the assets, projects or properties for which you are collecting data. Include image(s), drawings and url(s) to pdf documentation if applicable. 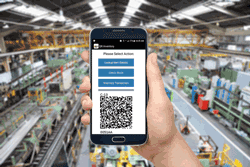 Your employees will be able to review this information in the field by scanning QR code / barcode label with a smartphone, take and add photos and update data (for example, update measurements). Document everything that was used and done for each task in real time. Use smartphones or tablets for barcode / QR code scanning, mobile data collection and data access. Make sure that your employees have all information in the field to do the job right. With QR Mobile Data mobile application they only need to scan QR code or barcode on the asset, property or project to get access to the item information, previously done tasks and get list of the mobile forms to fill out for the task at hand. Employees fill out mobile forms on a smartphone in real time, as they complete the task. As an employee fills out a form, data are automatically saved on a smartphone - (s)he can stop and resume at any time, and be sure that collected information is not lost. Need to provide an illustration of the task or visual documentation of what was done? QR Mobile Data makes it easy - an employee can snap a picture with a smartphone and include it as a part of the form. An employee can collect a signature if required. When the form is completed, it is submitted to a centralized cloud location and becomes instantly available to all authorized users. An employee can update item information in the field and take additional photos if required. Make sure that your business operations documentation is in order, and that you can easily find required information. All collected data on the completed business operations and tasks are stored in a secure, centralized cloud location. Authorized employees can access collected records in real time from any device and location. You can search records by multiple parameters to find exact information you need. Monitor project progress, know where are you in the process at any time. Review collected data, images and signatures for each asset, equipment, property or project via a web dashboard or on a smartphone. Tracking of business operations often goes hand in hand with the assets and inventory tracking. QR Mobile Data combined with QR Inventory allows you to keep track of both in one easy process. For many business workflows, tracking of the business operations are tightly linked to tracking of the assets and inventory. For the property or equipment maintenance you may want to track work tools check outs and returns. You may need to track parts and materials used for the task, and what do you have in stock. When you record operations such as farm field fertilization, you need to record what fertilizer and how much was used, keep track of the stock and get an alert when you need to order more. With QR Inventory application (which is fully compatible with QR Mobile Data) you can do just that. 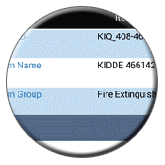 Track assets re-location, manage inventory, parts and supplies by scanning QR code / barcode label with a smartphone. 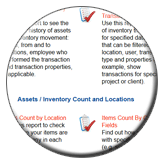 Collect any additional information for inventory transactions. Define what do you want to track, record and report via a web dashboard. Track inventory by SKU, batch number or serial number, based on your requirements and business workflow. 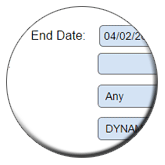 Set re-order points and receive automatic low inventory alerts. Review and export reports on inventory count, locations, transactions history and usage.